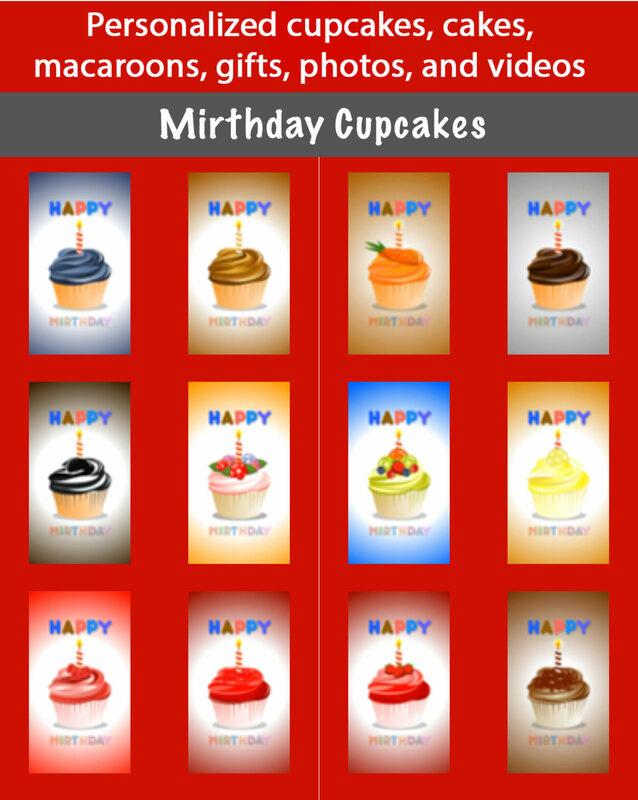 This animated customizable birthday cupcakes, cakes, macaroons, jewelry, photos, and videos Happy Mirthday™ App is remarkable. It lets you communicate and share your most precious greetings, emotions, and wishes with your mother on the day she remembers you the most, your birthday. Additionally, it enables you to customize and share birthday cupcakes, cakes, macaroons, jewelry, and your own photos videos with your friends and family on their birthdays. Simply click on your choice of this creative rich verity of animated gifts and write your special words selecting your favorite font style, color, and size, and then share it. On the other hand, write your own words on your photos and videos; additionally, you can add your own voice, sound, or tune to your videos. Have fun extending your wishes whether you are extending them to your mother, friends, or family. Enjoy the power of giving a beautiful animated gift warped with your gifted words. Get HAPPYMIRTHDAY ™App from the App Store today and enjoy all these awesome animated gifts on your device! Copy right© 2016-2017 Miriam Global Green Solutions, LLC. All rights reserved. Thank you for visiting the HappyMirhtday™ App's site for iPhone, iPad and iPod touch. To download the HappyMirhtday™ App please use the App Store from your iPhone, iPad or iPod touch. You can download the HappyMirhtday ™ App by clicking on the App Store Badge on the bottom of our home page. Currently the HappyMirhtday ™ App is only available for the following Apple products: iPhone, iPad, and iPod touch. Sorry for the inconvenience, Please visit our website often for updates on other platforms. To contact our technical support team please call 1-800-717-2174 THANK YOU FOR YOUR SUPPORT. Copy right© 2016 Miriam Global Green Solutions, LLC. All rights reserved. Apple, the Apple logo, iPhone, and iPod touch are trademarks of Apple Inc., registered in the U.S. and other countries. App Store is a service mark of Apple Inc.